The continuing debate over the debt ceiling and the general state of the economy raises matters of such a magnitude that we tend to be overwhelmed and confused. Perhaps the best way to address these issues is to leave the almost surreal world of multi-trillion dollar liabilities and come down to earth with some basic observations. There is obviously something seriously wrong going on here. Everyone knows we cannot live beyond our means. That is elementary economics. The real question is not how we can continue overspending but rather why we insist upon doing so. This is not an economic problem but a moral one that lies deep inside the soul of the nation. As I see it, the life of our nation has increasingly taken on the atmosphere of a huge party. Everyone wants to keep participating in the festivities. As a result, we have created a kind of unreal carnival-like atmosphere where we ignore aspects of reality. Parties, of course, are by their very nature extraordinary events bordering on fantasy. They are times when we can take a break from the hard reality of making a living and indulge in celebration. Thus, the wine and food flow in quantities outside the normal rate of consumption. People dress up (or used to dress up) in the best outfits as a manifestation of celebration and social posturing. The revelry goes on late into the night as people let go of their concerns at least for a small time while everyone takes comfort in knowing that the host is picking up the tab. However, our great American party is different. It began as occasional celebrations to celebrate our achievements. But over the decades, the party has gradually taken on the character not of an exceptional event but the norm. It has almost become an entitlement where everyone claims their right to continual festivities – their right to be always happy. This attitude is found not just in government but everywhere as it has increasingly pervaded our culture and habits. In our ongoing American party, there is an attitude of carefree consumption where we have the idea that the food and wine will flow forever. There is the idea that no one can suffer any want or privation but rather all must proclaim: I must have it and have it now! It is an atmosphere of casual relationships where if you are dancing with a partner for too long you can always change for another and dance as long as the band keeps playing. Our partying society excels most in its entertainment. Everything must be enveloped in party fun and laughter. Entertainment has come to invade all aspects of our life so that we now have entertainment-news, entertainment-politics, entertainment-advertising and entertainment-everything. We are surrounded by dazzling spectacle, salacious scandal and flashy gadgetry to amuse us. There is always one more joke or one more extravaganza to keep the show going. This seems to be the atmosphere in which we live. Life is a party, a carnival, a beach or a Hollywood movie. We are told to maximize our experience of fun while we can. However, there are two tragic aspects of our American party that are killjoys to this vision of things. The first is the fact that a party can only exist in an ambiance where we are all enjoying ourselves. We must show no concerns, sufferings or cares to others lest we spoil the party. While such an attitude may hide our hardships, it does not eliminate them. Thus, it creates the enormous suffering of pretending we are not suffering. Inside our lives, tragedy strikes us and yet all the while, we must put on the show that we are thoroughly enjoying ourselves. The second tragic aspect is that someone must pick up the tab. The party thrives on the appearance of limitless consumption and largesse. To keep the excitement going, the party needs constant infusions of novelty, thrills and money. In the exhilaration of the moment, we defer any idea of expense for the morning after. Our never-ending party never addresses the morning after. As long as the party keeps going on, it really doesn’t matter who will eventually have to pay – the government, our credit cards, second mortgages or any other financial magic that postpones the day of reckoning. The problem is the day of reckoning is approaching. Just as any individual cannot afford to host a non-stop party, we can no longer sustain our party economy. We cannot afford the American party anymore. More importantly, we ourselves cannot keep partying indefinitely. We reach a point of exhaustion that comes from the fact that even the best of parties can only last so long, after which there enters fatigue, rowdiness, boredom and frustration. The problem is no one dares to break the consensus and suggest that perhaps the party should not go on. In fact, just the opposite is happening. The solutions being proposed do not address this problem. Everyone is looking for ways to prolong the party. The liberals on the left, in socialist fashion, call for bringing the chic partiers upstairs down to the common dance floor. The conservatives, in Gospel wedding fashion, announce the time has come to start serving everyone the inferior wine. 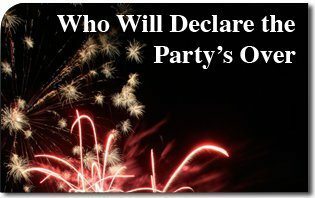 No one dares to declare the party’s over. However, that is what we need to do. We need to face the fact that we cannot sustain this artificial environment of happiness entitlement. We must calmly face the reality of life’s sufferings, tragedies and misfortunes outside the din of the party. We must avoid dramatic or instant push button solutions that themselves take on the appearance of the great shows of the party. It will take much blood, sweat and tears to put the house back in order. We realize these considerations do not directly address the deficit or the state of our economy but they do point in the direction of a solution. We are not saying it will be easy. All we are saying is that the first step to a solution is to declare the party is over.